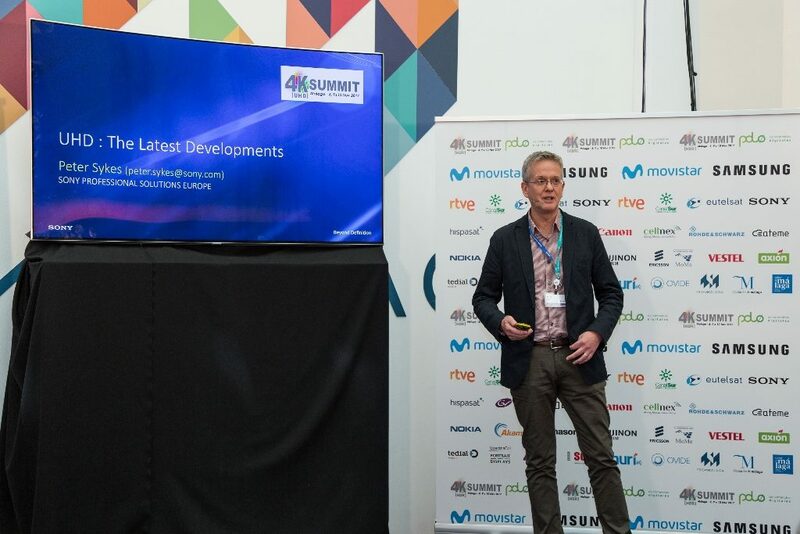 The 4KSummit, which has reached its maximum capacity with over 300 registrations, is the only event that gathers prestigious Ultra High Definition content and technology experts so they can share their experiences within a top level multidisciplinary event. The opening lecture was given by the President of Telefónica Spain, Luis Miguel Gilpérez. In his opening lecture, Gilpérez assured that users can choose what to see, when and how thanks to Movistar+, changing the way the Spanish people watch television. The changes experienced by this sector in order to offer a better visual experience to users, have been explained by Nacho Monge, Audio and Video Marketing Manager of Samsung Spain. In addition, he has analysed the evolution of video formats, 4K technologies and UHD. Monge has participated in the development of some of the latest innovations of Samsung, which have already been included in the new QLED TV devices that have been launched into the market this year. Michel Chabrol, Vice-President of New Television Formats, has presented the Ultra #HD Eutelsat TV Observatory in the 4KSummit, according to which there are currently one hundred channels in the world offering Ultra HD / 4K services through satellite. However, 4K is still far from reaching the implementation level of HD. The morning session was closed by Paul Gray, analyst of IHS Markit, who offered an analysis on the 4k market from a global perspective. He will also be in charge of explaining the five conclusions that will close the 4KSummit on Friday 10th. Peter Hutton, CEO of Eurosport, brought sports to the auditorium of the Digital Contents Hub of Málaga and, along with Fernando Ruiz, Chief Editor of Eurosport Spain, and Guillermo Jiménez, Broadcasting Systems Director of OBS, talked about how the channel is preparing for the next broadcasting of the Winter Olympics of South Korea, and showed a trailer of the documentary series produced by Medina Media for Eurosport: “Rumbo a Pyeongchang” (“Heading to Pyeongchang”). 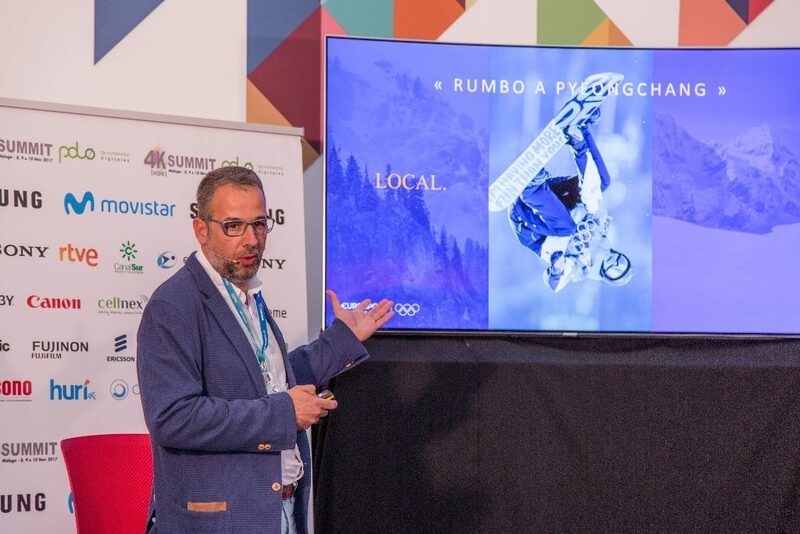 On the second day of the 4KSummit, which was at its maximum capacity, the current situation of Ultra High Definition, as well as the evolution path that it is expected to take, were put under analysis. In addition, attendees could know the newest cameras, lenses, contents and solutions for 4K-UHD. The final consumer has been one of the protagonists of the 4KSummit. Professionals such as Michael Zink, from the UHD Alliance, have assured that the evolution of this technology isn’t possible if users don’t demand this type of content. That’s why getting to them must be a task that must be given the same importance as the development of this technology. 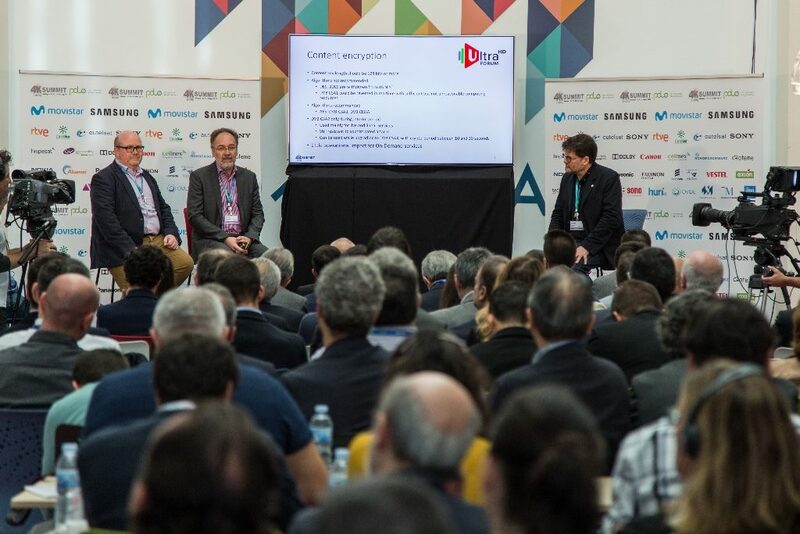 On Thursday, the 4KSummit offered one of its most expected contents: the masterclass of the UHD World Forum. This event had only been celebrated at the NAB Show of Las Vegas and at the IBC of Amsterdam. 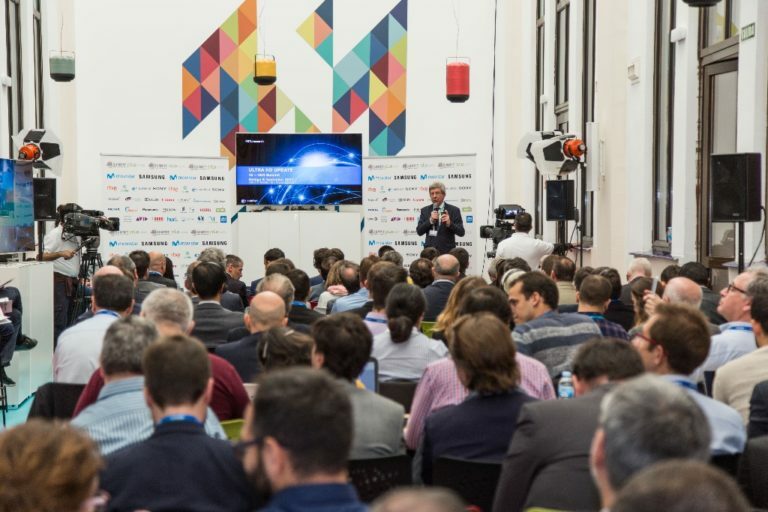 The auditorium of the Digital Content Hub of Malaga hosted the most important convention gathering leading Ultra High Definition (UHD) engineers and content producers. Here, prestigious engineer David Wood, offered a constructive view of the current situation of this technology. 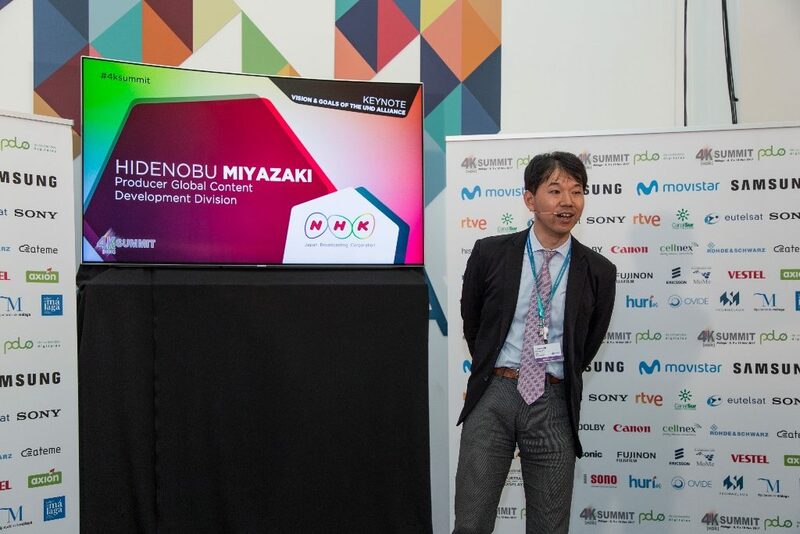 Hidenobu Miyazaki, from the NHK Japanese TV, gave the opening lecture of the afternoon session, in which he stated that technological evolution is unstoppable and he also presented the work of this Japanese channel in 8K format. Miyazaki announced that, by December, they will broadcast content produced in this format, which has a higher quality than Ultra High Definition, 12 hours a day. Simon Gauntlett, Director of Image and Technology Standards at Dolby Laboratories, presented Dolby Vision, a prestigious technology that is being used by brands to attract consumers. Dolby Vision is a technology that improves HDR image reproduction. However, there was also room for contents in the lectures of the 4KSummit. Discovery Communications and Paramax Films, which face the challenge of its creation and distribution, drew attention to the need of investing in technology in order to develop 4K contents. In addition, Luisa Fernández, from Hispasat, announced that the 4K Short Films Festival will be held in Malaga, within the fourth edition of the 4KSummit and with the support of the Malaga Film Festival. However, important lectures will also be given on the last day. The most relevant will be the one offered by the FAME Forum, which will share the conclusions of the attendees, and the expected summary of the event that IHS Markit analyst Paul Gray will share with the attendees.